In the business world, customer service can be viewed as one of the most crucial aspects to whether a company is successful. Customer service can play a critical role in sustainability — regardless what field of work. This aspect of business can often be overlooked by not just owners, but the entire staff. There are even studies that have shown that customer service can be more valuable to customers than the price. Owners and employees must focus on the core of the business and the customers because without customers, there is no business! Focusing on taking good care of customers can lead to opportunities whether that be from word of mouth, advertising and referrals or even new business chances such as partnerships. Customer service has really changed in the last decade as the Internet has grown. This growth has led to the ability for customer service to progress businesses — or in some cases, regress. Technology has filled the business world with multiple channels of communication means between business and customer. In the last few years, the use of phones, the web, chat applications and social media has grown tremendously. In this growth has come the social media takeover where nothing happens without social media finding out. While a customer might be satisfied with a business’s service, it is likely that that same customer will be much more vocal if they are unsatisfied. Giving someone poor customer service can not only result in the loss of their current and future business, it can also lead to negative posts on social media in which hundreds to thousands of people might see. This could have a much larger effect on a business than one might think. This makes it so important to treat each customer with the care and respect that they each equally deserve. Vision Homes Inc. strives to exceed the customers’ expectations in both service and quality. We provide an honest, pleasant environment in order to make building your home a fun and enjoyable experience for you and your family. From the foundation that started Vision Homes, Mike Helwig and Rocky Simmons, to the current team here today, we truly believe that our customers are true friends and family. We all understand that our customer service builds trust, gives a sense of comfortability and creates a smooth work environment for both us and more importantly the customer. Here at Vision Homes, we believe that we have a high level of customer service because we make communication with the customers a priority, are on time for meetings and appointments, stick to schedules made for our customers’ homes and respect and value each and every customer. We know all the little things that we do for our customers do not go unnoticed because the customers show much appreciation when Dave, our salesman, stays late at the office to finish their house plan, helps find land for sale or meets with them on a Saturday. They also appreciate Twila for letting them tour her house, which was built by Vision Homes. As for the construction side of Vision Homes, we cannot forget our Construction Superintendent/Owner, Guy Helwig, and our Warranty Manager, Paul Barker. Guy is always ready to help by answering questions, whether it be at the office or at the home site. As for Paul, he is always positive, cheerful and readily available to help our customers with any of their home warranty needs. Being a custom home builder, it is imperative to realize the importance of high levels of customer service. We believe we have been able to maintain this incredible customer service because we make it a priority to find out what each customer’s needs and wants are for building a new home, which then lets us set clear objectives for the home building process. Then referring back to our mission statement, we try to exceed our customers’ expectations every time! The 22 successful years of Vision Homes has undoubtedly come from the hard work of the team and the ability to work so well with all the customers that we have been lucky to work for. Thank you so much to all of our wonderful customers over the past 22 years! If you'd like to leave a review of a home we've built you, feel free to visit Vision Homes' Facebook page. At Vision Homes, we understand that the journey to building a home may seem daunting. 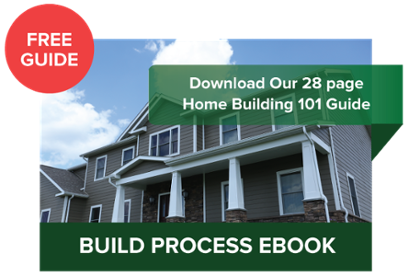 Download our free Home Builder's Guide, and feel free to call us with any questions at 304-296-0024.